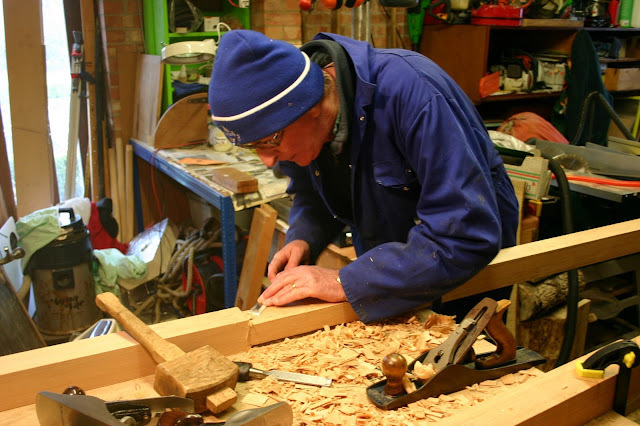 It's all go on the St Ayles Skiff front. Tomorrow, I am going to the Beale Park Boat Show on the Thames near Pangbourne, where the southernmost skiff in Britain (so far) will be making an appearance. Constructed over the winter by a group in Blakeney, on the Norfolk coast, the skiff is called Hoi Larntan, local dialect for a skipper or master, meaning 'high lantern' or 'high learned one'. Apparently. I hope to get a row in her tomorrow. The picture above shows Adrian Hodge working on a spar, wearing what looks suspiciously like a Langstone Cutters beanie presented to him when he put us all up for the Carrow Cup race last December. We hope it kept that famous Norfolk nip at bay. 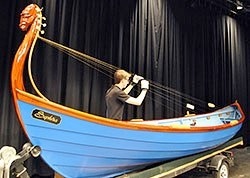 The westernmost St Ayles Skiff (probably) is coming over to Scotland for the World Championships, and she is without doubt the most unusual so far constructed. In fact, she is unique among boats, being also rigged as a sort of harp. Sephira was built by pupils of the Moravian Academy in Bethlehem, Pennsylvania, under the direction of the woodwork teacher Michael Brolly. He decided the boat did not do enough for the plight of whales, so he added a series of strings that can be rubbed to produce sounds at the frequencies that whales can hear, down in the briny deeps. "It is believed that the size of the instrument will convey to the whales the seriousness of our intent to communicate with them", Michael writes on the Musical Ark website. Michael is bringing Sephira to Scotland under his own steam, unassisted by the school or anyone else, and he needs a lot of help with the cost. Contribute lavishly to this endeavour at his Kickstarter page, which also has a rather good video of the boat in action. Finally, the first St Ayles Skiff in Canada has hit the water of the Bay of Quinte. One might assume it was the northernmost St Ayles Skiff ever. After all, it's in the Land of the Frozen North, no? No. The Bay of Quinte is 44 degrees North, and even my house in the soft south coast is 50 degrees North. Thank god for the Gulf Stream. 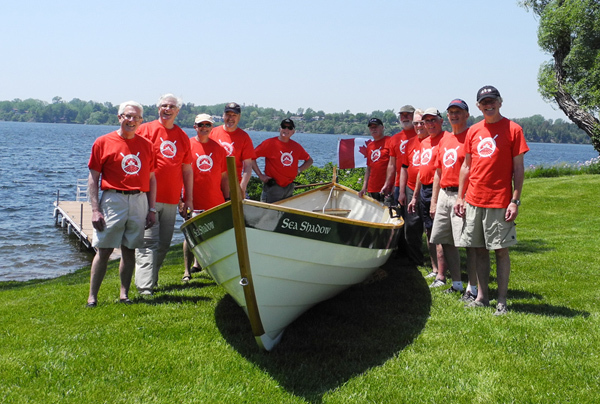 I believe the western most St Ayles skiffs would be the two now completed in Portland, Oregon - the crew of the first Portland skiff (Rosie)will be attending the Worlds next month (but not bringing their boat...). By far the most interesting St Ayles is Sphira, whether she can communicate with whales or not!